"What do you mean, writing a Passion Play? There's nothing to do, is there?" Deeply involved in the struggle of scripting the concept of The Turramurra Passion, this question stunned me. It came out of a genuine mindset - that the deep and long tradition of the genre dictates the present. And in any case, Scripture is the "source", so what is there to write? The vision for the play was to tell the story of Easter in a contemporary way, and to grab hold of its meaning without resorting to "historical correctness". Attempting and/or claiming to present an "accurate" account of the events of The Passion - the death and resurrection of Jesus the Nazarene - is going to be futile - critics and audiences alike will spend more time finding the chink in the accuracy of the production, as Mel Gibson has found, than they will engaging with the story. 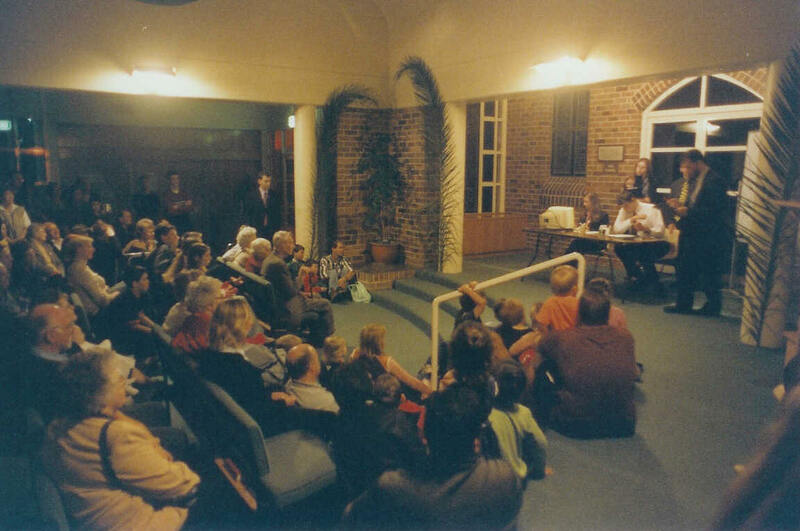 So, from the beginning, The Turramurra Passion was conceived as a character driven drama, with reliance on the depiction of the relationship between Jesus and those around him. Very little of the play is set in time, there is little costuming, and the sets largely rely on the existing architectural forms of the building the play is performed in. 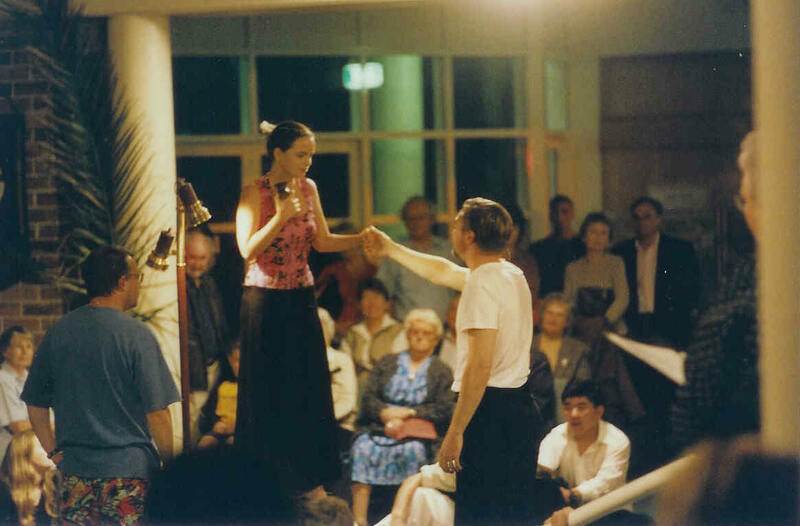 This was essential for the inaugural one-off performance in 1999, where time was very short, but it has become a signature characteristic of the play. The main backbone of the script comes from the Gospel of Luke, and is based on the modern paraphrase translation by Eugene Peterson known as "The Message". Peterson's ultra-contemporary American idiom sometimes jars, but he has adopted a scholarly approach to the task of bring the ancient texts to life in modern language. The Bible tells us much of the story, but it also presents it from several points of views. Each Gospel writer brings their own perspective and emphasis to their telling of the story, and our own recollection of the Easter story is actually an amalgam of these versions. So from other Gospels, teachings and events from Passion Week have been inserted. Contemporary film has been a big influence on the script. Jesus of Montreal, for example, tells the story of a group of actors who are engaged to modernise a Passion Play that has growth stale in its traditional approach. 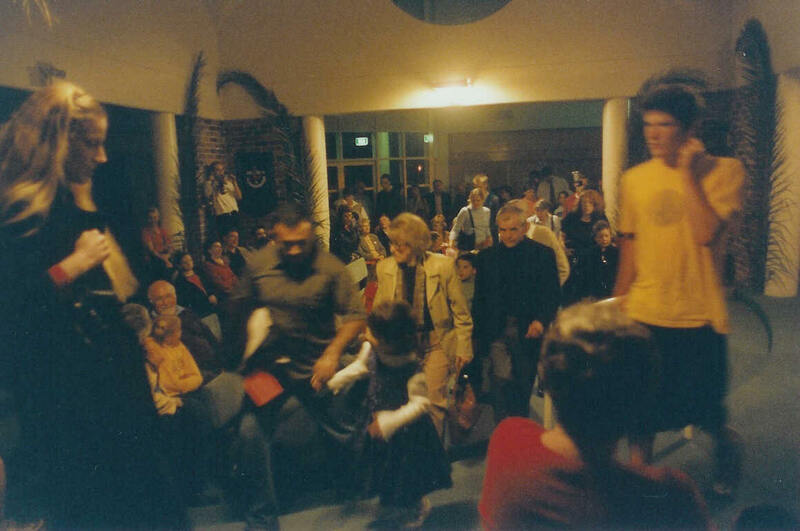 While The Turramurra Passion has not adopted the somewhat revisionist theological perspective of the modernised play in the film, the dramatic techniques portrayed, such as audience movement, minimalistic and stylised sets and a blurred line between audience and cast, can be seen in both works. Perhaps the most complete and satisfying recent portrayal of the life of Christ on film is The Miracle Maker. Produced in the UK, using a team of Russian puppeteers and animators, it is a unique and engaging film, telling the story from the point of view of Jairus' daughter. The film develops fully rounded characters of the disciples, particularly of Peter, which are in sharp contrast to the rather one-dimensional characters that inhabit "faithful" retellings of the story on film (eg The Jesus Film). The Passion of the Christ, released in 2004, has not had a direct influence on the development of the script. Without a $30m tomato sauce budget, The Turramurra Passion cannot hope to adopt the hyper-realism of the film. In many ways these two works could not be more different: the film immersing the viewer in the horror's of Christ's suffering, while the play is driven by the character portrayals of Jesus, and those who were affected by their contact with him. Through a series of chance international internet contacts during 2004, I obtained a copy of the script to a series of radio plays from the 1940's. Dorothy Sayer's work The Man Born to be King is astonishing it its vision - 12 one hour radio plays, portraying the life of Jesus, broadcast on the BBC. The series was hugely controversial at the time, with even having a portrayal of Jesus attracting criticism. Questions were asked in parliament, the BBC pressured to stop the production. Reading the scripts now, it is hard to image what all the fuss was about. The skill with which they were written is remarkable. It is interesting to read the difference between what has to be written to communicate in this medium compared to the stage. Oh, to get my hands on some recordings. 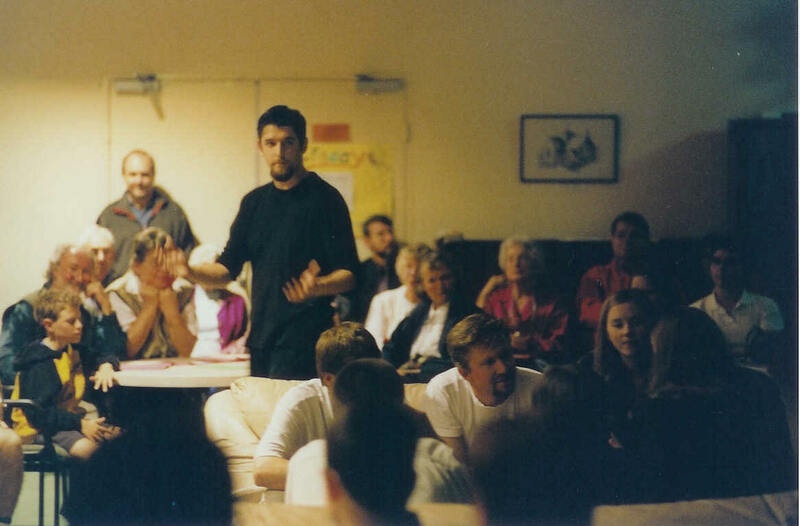 This scene was added to the play in 2001. Without it, the play suffered from one of the shortcomings of The Passion of the Christ, (although not as acutely) in that the audience didn't know enough about Jesus, or understand his character enough, to fully grasp the climax of the story. The audience and cast assemble in a casual lounge area. The play opens with a scene from John 3, where Jesus meets Nicodemus, and the recurring theme of "light" is first introduced. Then, some of the disciples (5 of them) emerge from the audience and tell something of what has happened over the previous 3 years. Each of their stories brings out their character and the impact that Jesus has had on them - and through that, we learn about him. They assemble in a casual setting evoking Central Perk from Friends. We also meet the High Priest Caiaphas. The play moves from recollection to action, with the entry of Jesus into Jerusalem on Palm Sunday. This has been a difficult scene to stage, but was finally perfected in 2004 with the addition of taped crowd singing to give consistent volume to the crows. It is impossible to rehearse a genuine crowd scene, where Jesus and the disciples enter the city through an adoring throng. While the teachings recorded in Luke's Gospel as having occurred during Passion Week are the backbone of this scene, a little licence is taken with adding some events from just before that, again to round out the characters more fully. The scene is set in a foyer, and the architecture is used deliberately, with the angled ceiling being transformed with projected 35mm slide images used to support the story - to create a tree canopy for Zaccheus, and to illustrate some of the stories that Jesus uses in his teaching. A soundscape of market "noises" adds to the atmosphere. The audience forms a "crowd" and are drawn into the action, again as cast members emerge from their midst to participate in the action. The end of the scene includes an interaction between Judas and Caiaphas. In staging the play, it is necessary to adopt a construct for Judas' motivations for betraying Jesus, and the scriptural record is inconclusive on this. Judas is portrayed as a frustrated revolutionary, motivated not by duplicity or greed but by zealotry. Caiaphas cares little about Judas' motives - he has a problem that needs solving, and the means to a solution has fallen into his lap. Accompanied by evocative background music (performed live), the audience move from the foyer to a smaller overflow room through a narrow door. 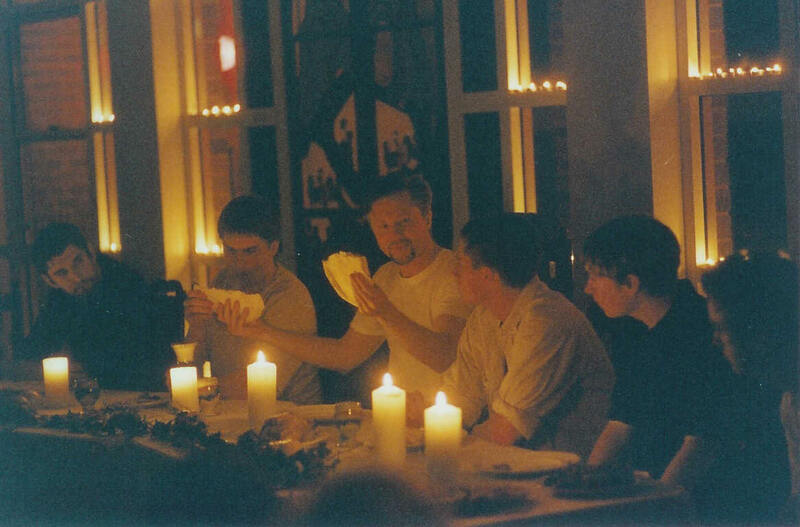 An iconic "Da Vinci"-like image of Jesus and the disciples at the Last Supper is created, with the sole lighting being from 100 or so candles. The light theme is linked in with Nicodemus seen to be lighting the candles. We see the disciples struggling to come to grips with what Jesus is telling them will happen, as they eat the Passover meal together and listen to his teaching. This scene has changed little since first performed, with only some minor dialogue additions. The front lawn of the building, and the surrounding Colonnade, forms the setting for the next two scenes. 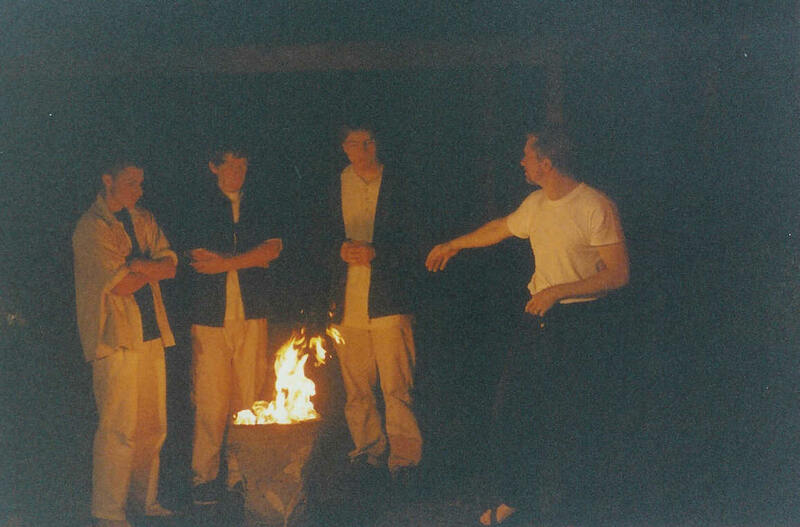 A small fire in an old rubbish bin fills the air with smoke and creates a new, intensely outdoor, atmosphere. This supports the audience's journey from the Upper Room to the garden on the Mount of Olives. Jesus is in anguish, carrying the weight of the world on his shoulders, and the script and direction was altered for 2004 to make this scene more challenging for the audience. The plot to arrest Jesus unfolds, with Judas taking the lead. Some of the cast double up as members of the angry crowd accompanying the arrest party. The sound of a lone drummer reverberates around the colonnade as Jesus is dragged away, and the disciples disappear into the night. 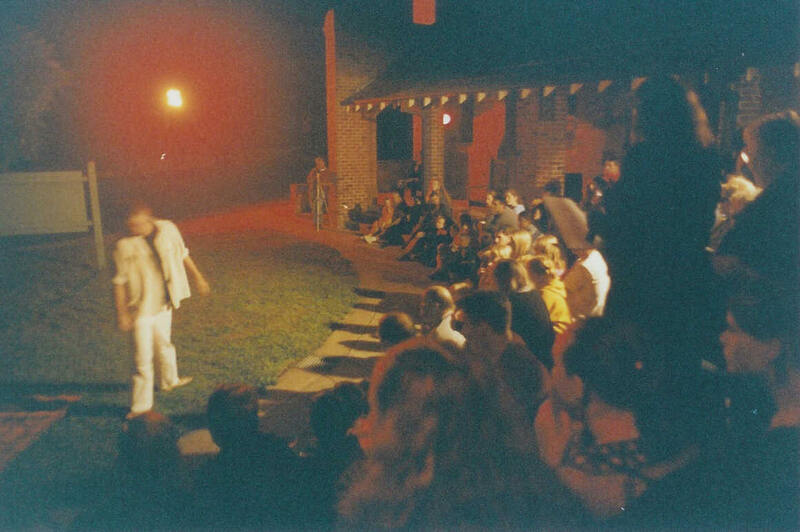 A shift in focus from the lawn to the Colonnade transports the audience to the house of the High Priest, where a sham court has been convened. There is an angry "rent-a-crowd" shouting for his execution, and again the audience find themselves in the middle of the action, not just observers of it. Having played the crowd and the assembled officials skillfully, Caiaphas sends Jesus to the Roman Governor, Pilate. The red lights used to spotlight the building during the lead up to the play for promotional purposes remain in place for the performances, creating an eerie light. The foyer used for the teachings scene has been rearranged for the Pilate scene. This is the scene that is perhaps the most challenging in the play. It asks the question: "What would happen if Jesus lived today?" It does this by being staged in the future from now, with Pilate as the thoroughly modern politician, relying on media spin to cover his tracks after he has given in to the pressures of politics, religion and his own ego. Reactions to this scene are overwhelmingly positive, but for some, it is too far from what they expect to see in a Passion Play. However, this is the scene that gives the play a sharp edge, the scene that most clearly challenges the audience to engage with the story and not dismiss it as a historical curiosity. Jesus is condemned and dragged away to be executed by crucifixion. The Crucifixion, Resurrection and Ascension. Staging the crucifixion in a meaningful way, without putting the actor playing Jesus in physical danger, is not an easy task. 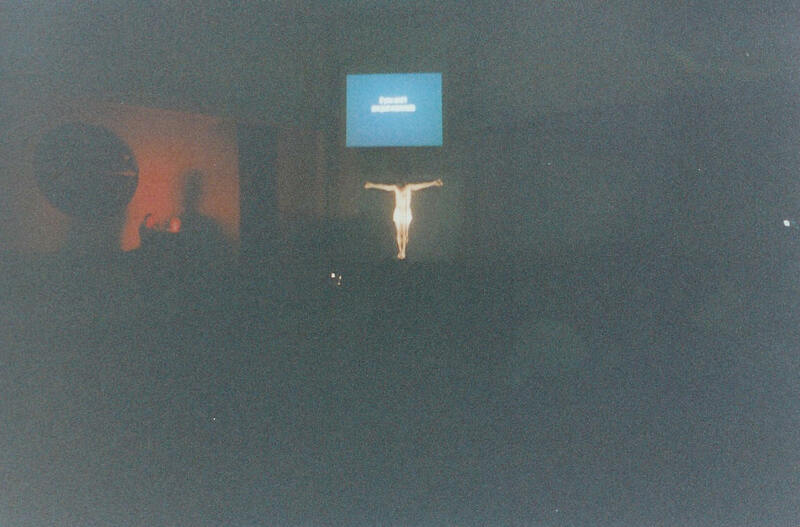 This challenge is met by bypassing the nailing of Jesus to the cross, and instead confronting the audience with a haunting image of Jesus already crucified - larger than life-size, projected from a 35 mm slide on the wooden cross that is a fixture at the front of the church proper. They enter this large space in darkness, apart from the glowing image, accompanied by a haunting piece of purpose written music. The audience are seated in a donut shaped configuration, and the action again unfolds around them, and their seats form the tomb, and a circular aisle is the stage for several "on the road" interactions. As events unfold, the light slowing increases until we meet the risen Christ. There are a number of audio-visual elements in this scene, with music, 35 mm slides, computer projected images and video. The play draws towards its conclusion with the each disciples telling the story of what happened next for them - in most cases ending in a horrible death. The play closes with the Nicodemus emerging from the darkness, still holding the light that Jesus gave him in the opening scene. He has been carrying the light through the play, and it is the challenge of the light that he leaves the audience to reflect on, first in darkness, and then as the house lights come up. In 2006, the BBC staged The Manchester Passion. This was an ambitious project, broadcast live on TV, with multiple outdoor settings. It was also a musical, but written with Manchester Music - by New Order, Joy Division, James and other Manchester bands like Happy Mondays and Stone Roses. What would "Passion in the Pub" look and sound like, written around iconic Australian secular music? Dave Cornford is researching and writing this different concept, for staging in a different context some time in the future. If you belong to a church or community theatre group which would be interested in staging a Passion Play of your own, the team from the Turramurra Passion is keen to assist, with general guidance, sharing our vision and journey, and even possibly sharing the script. Contact the Director, Dave Cornford, if you would like to discuss some ideas for further development.